During the 1920s and 30s, the British photo magazine, the "Illustrated London News," published an article on the work of three artists who were seminal in the founding of modern space art. It included Lucien Rudaux and Chesley Bonestell. The third artist, equally as brilliant, is all but forgotten today. In many of his depictions of other worlds—in particular the moon—Scriven Bolton (c1888-1929), developed an uniquely effective technique: he built detailed plaster models of the moon's or planet's surface. These were photographed and Bolton then painted stars and other details onto the final print. 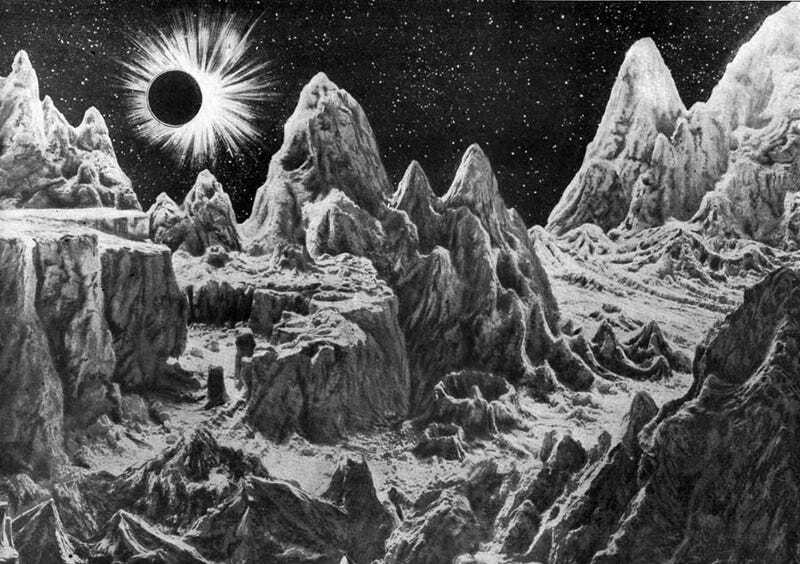 Chesley Bonestell may have been influenced by this technique (as well as his work in the late 1930s and 40s as a special effects artist in Hollywood), since many of his earliest space paintings also employ exquisitely rendered model landscapes. Indeed, some of Bonestell's most famous paintings, such as his iconic "Saturn seen from Titan," look like photos because, in large part, they are photos! Thomas Simeon Scriven Bolton was not a professional astronomer. He was not a full-time artist, either. Although a member of the staff of the "Illustrated London News" for 15 years, where he specialized in depicting astronomical subjects, he worked as an oil merchant at Bramley, Leeds, where he lived with his widowed mother and sisters. In a field next to his home he had a private observatory, equipped with an 18-inch reflector. For a period of seven years he carried out studies of variable stars, which were published by the Royal Astronomical Society. The astronomical illustrations he prepared for the magazine were reprinted widely, including US magazines and newspapers. His unusually realistic method of depicting the planets gained him numerous awards, such as a gold medal in the 1908 Franco-British Exhibition. Bolton died on Christmas Day as he was in the process of installing a new telescope in his observatory. An annual lecture series at the University of Leeds—to which Bolton had bequeathed his 2-foot reflector mirror (now in a private collection)—is named in his honor.